The first trip to Brancaster looked at a B class two stroke that was well ahead of its time. The return journey discovers another quite amazing piece of engineering from John Duffield. 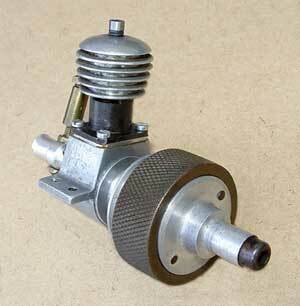 Again a 15cc two stroke, but this time with an eccentric vane supercharger built integral with the engine. This was the last motor to be built by John and probably was never run in this form, but with the supercharger removed and the engine fitted into a purpose built lightweight hull it was run successfully by John Demott in the 70s and 80s, and by Lynn Blowers more recently. A detailed look at this engine and its more recent history has now been added to the site. Look at the size of that plug! 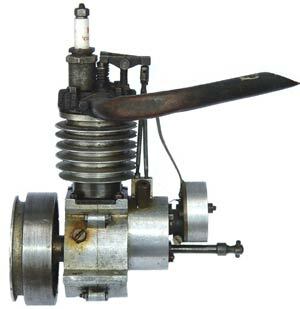 This 15cc four stroke boat engine was retrieved from the same source as IGO and EGO in the hydro pit box. It qualifies as a 'wotzit' as no details about its origins are forthcoming. It follows the trend that was prevalent in the 30s of having a large flywheel towards the bow of the boat. The extension shaft and coupling can be seen below the contact breaker, which is moveable to alter the timing. They do things different in Norfolk! The Kings Lynn Club had three confirmed tethered hydroplane fans who refused to be bound by normal practice. Messrs Stalham, Chapman and Duffield could always be relied upon to produce something unusual. This 15cc two-stroke dates from the late thirties and was the work of John Duffield. 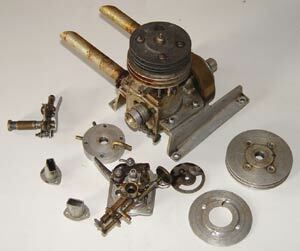 What makes this engine especially interesting is that as each development was made the discarded parts were not consigned to the bin but kept with the engine so that there is a complete record of development from the early water cooled head and petrol carb to the highly sophisticated micrometer fine adjustment version shown on the backplate with the ignition. This motor had its last run at the 85th anniversary meeting of the Victoria Club where it won its class at over 30 mph. 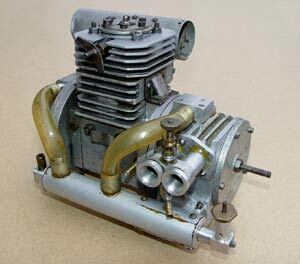 This unfinished 30cc flat twin engine has recently appeared on eBay. It was the work of Stan Clifford, one of the most famous tethered hydroplane exponents over the decades, with boats such as Chatterbox, Blue Streak and the all glass fibre ‘Polyester’. Clifford held the British record for no less than 14 years from 1922 with Chatterbox II and III. 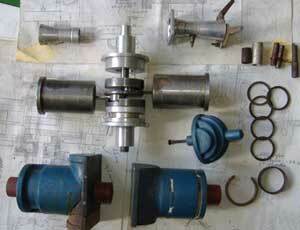 The engine is ‘as seen’ but is complete with all relevant drawings, crankcase and cylinder head patterns. Unusually it was intended to be water-cooled, almost certainly due to the flat twin configuration. The vendor also has a set of plans and details for a distinctive hull intended for the engine. It is to be hoped that someone can take on the responsibility of finishing such an important engine and construct an appropriate hull. Edgar Westbury designed engines probably powered more of the early tethered cars than all other engines put together. Of these, the 5cc Kestrel was certainly the most common being installed in several well-known cars, such as Lucy Gascoigne's MG Record Breaker, as well as any number of other cars, until commercially produced engines became freely available. 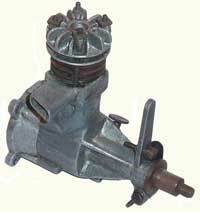 The Kestrel was designed around 1935 and intended for home construction and has several interesting features, such as a rotary disc valve running on the inside front face of the crankcase.